A couple weeks ago Molly and I, along with my parents, took a Sunday trip to the homestead of Lawrence Welk. To be more specific, this was the homestead of Welk’s parents in rural Emmons County, south-central North Dakota. The homestead is just south of Braddock, North Dakota, the place where my great grandpa Barth established his homestead and family. The Barth’s were Ohio-Germans imbedded within this larger German-Russian migration group. Earlier this afternoon I stopped by North Dakota State University’s German-Russian Heritage Collection to pick up a Gary P. Miller reproduction print from 1930. 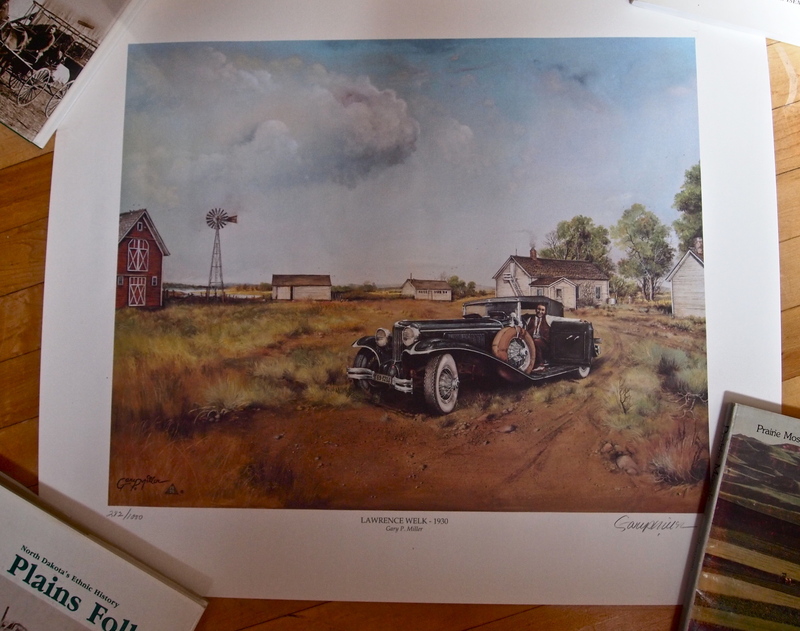 It is what today we might call a mash-up: Miller painted Welk and his Hollywood roadster into the Emmons County homestead setting. In an effort to unfurl this print, I placed four of books at the edges. It seemed fitting to deliberately use Plains Folk: North Dakota’s Ethnic History; Prairie Mosaic: An Ethnic Atlas of Rural North Dakota; Prairie Peddlers: The Syrian-Lebanese in North Dakota; and The Quartzite Border: Surveying and Marking the North Dakota-South Dakota Boundary, 1891-1892. The Welk homestead today is undergoing continued rehabilitation. One can get a guided tour of the original sod homestead, and a couple outbuildings and the summer kitchen. This latter building, the summer kitchen, still speaks to the utilitarian sensibilities often inherent in North Dakotans: the summer kitchen kept the heat out of the otherwise cool sod home in the June, July and August months. It was straight-forward practicality that German-Russians brought with them when they migrated to North America from Odessa, Russia. Within Miller’s 1930 print, the summer kitchen is center-right in the reproduction, and the sod house is just to the left. This entry was posted on Tuesday, September 2nd, 2014 at 2:53 pm	and tagged with Great Plains, Great Plains History, North Dakota, Public History, South Dakota, Welk Homestead and posted in Uncategorized. You can follow any responses to this entry through the RSS 2.0 feed. Your descriptors are amazingly graphic and pop right up in my minds’ eye, Aaron. You write and share so well. Beautiful. Thank you for this thoughtful historical reflection.